If you want to add the same tabs to all your products (this is useful for shared information like shipping information), please refer to global tabs by clicking here. You are looking to add per-product information (like specifications, ingredients...)? If so, unique tabs are the answer to this problem. 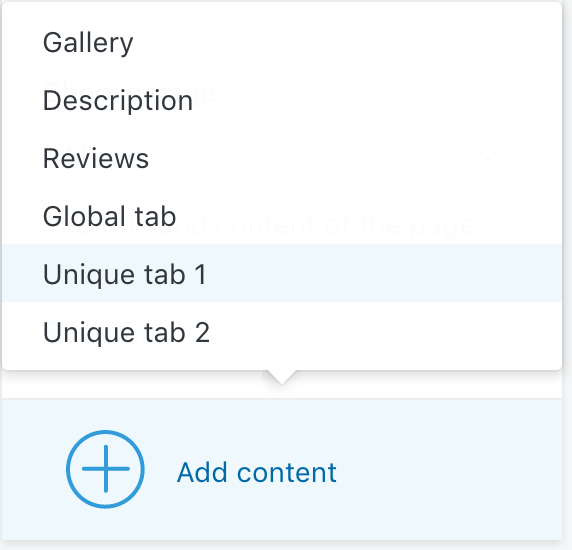 Unique tabs allow you to create pages that are attached to your products using a tag mechanism. Create a new page in Shopify admin. This page will hold the content of your unique tab. You can create a page in the "Pages" section of your Shopify admin (if you are already logged, you can click here directly). Once you have created your page, we need to retrieve the page handle. To get the page handle, open the page in the admin, and at the bottom, you will find a box called "Search engine listing preview". Make sure to write down the handle, we'll need it later. Then, we will need to inform the theme that we want to display this page's content as a tab for a given product. To do that, in your Shopify admin, open the product that you want to edit. At the bottom right of the product page, you should find a section called "Tags". We are going to add a special tag that allows to instruct the theme to use our page. For using the first unique tab, you will need to add the tag __tab1:page-handle. For the second unique page, you will need to add the tag __tab2:page-handle. the tag starts with two consecutive underscores! If you only write one, it will not work. Repeat the process by creating new pages, and attaching them to your products. Finally, we need to configure the theme. The process slightly differs based on the theme you are using. For Focal, Trademark, Prestige and Warehouse themes, you have nothing else to do. As soon as you add the tab to your product, it will automatically appears in the product page. Kagami allows you to re-order product tabs. Because of that, the theme cannot know in advance where to display the unique tab. Therefore, we are going to need to manually add the tab. To do that, in the Theme Editor, navigate to a product page, so you can have access to the dedicated Product section setting. If you add the "Unique tab 1", it will displays the page attached to the __tab1:* tag. Similarly, if you add the "Unique tab 2", it will displays the page attached to the __tab2:* tag. This is pretty nice, however this requires the usage of a lot of pages. Hopefully, our theme comes with a more advanced feature that allows you to add unique tab without the usage of page. You can learn more here.